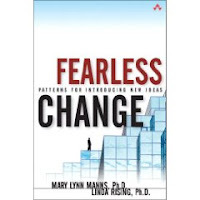 Fearless Change by Mary Lynn Manns and Linda Rising. Heard about the new book quite a long time ago (December last year) when I saw the excellent InfoQ interview Linda Rising on "Fearless Change" Patterns. What did I want to learn? I was intrigued by the handful of patterns for introducing New Ideas that were presented in the interview and I wanted to find out more. More patterns and more about each pattern. I knew from the first minutes of the interview that the book presents solid, good quality material in an area of interest to me: Improvement. I also recognized a number of patterns I have applied without knowing that they do exist (They are only Patterns, theee!). I wanted to find out what I already know from Linda and Marry Lynn's pattern language. 1. A set of words. When I finished the book, the pattern names were the first thing I remembered. Words describing situations in which I have been before, and unexplored situations I might encounter. I know that what I will carry with me from now on will be the words (names of the patterns). Like with any other pattern language I'm sure I'll remember it's words on hard, stressful situations. I'm already creating sentences, and I hope in the near future, I'll be better understood by others. 2. More about people, their expectations , reasons, powers and reactions. More about Innovators, Connectors, Early Majority, Gurus and Generals and about the important roles they may play when a new Idea is tried to be introduced. 4. More about what I've done. Maybe like you, I have applied a lot of patterns in a variety of contexts. As described in the book, the patterns are not new, they might be seen as common sense, the only problem is that the common sense is "so uncommon" nowadays! Anyway, there is a difference between applying unconsciously and applying consciously: I feel now details I wasn't aware of, I explain a lot of reactions, I'm more confident in what I'm doing, ..
5. More about what I haven't done. I have the feeling that I could have done more if I were aware of patterns like Guru on your side, Whisper in the General’s Ear, Personal Space, Token, Sustained Momentum, .... I see now how the list get's growing! For me, the book is a foundation stone in a domain doomed to always be on actuality. It's a result of many years of work and ... it really helps! The book itself it's a new Idea in which I strongly believe. An Ideea I'm already introducing in my working environment: my colleague is reading it right now, and a third one is on the waiting list! In a future post I hope I will be able to demo the pattern language in a nice Hometown Story, meet you there!